Ask any Chinese parent and you are likely to get the same response, education in China is crucial, the ticket to a better life. The importance of education is drilled into Chinese kids from the craddle. Education in China has long been regarded as the single most important aspect to determine a person's future and success. It goes way back to ancient times when government officials were selected based on their performance on the civil service examination. Likewise nowadays, the Gaokao, or College Entrance Exam, determines who makes it into the top universities in the country. The GaoKao has been seen as the chance to change your life with children spending years preparing for it. Attitudes are beginning to change as the rigorous system and raw test scores are not seen any more as the only answer. It is becoming clear that in order for China to succeed on a global scale and bring about innovation, it will need more than engineers and technicians, and many other skills like creative thinking and risk-taking are necessary that are not being measured in test scores. 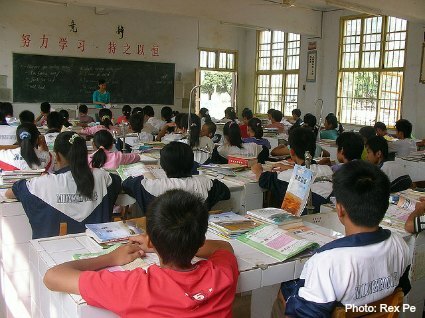 Access and quality of education in China is unevenly spread in the country. While in the rural areas schools are often poor and with limited resources, schools in the top tier cities are modern with computer facilities and the highest standards in education which consistently top the rankings in the OECD's PISA test given to 15 year-old high school students around the world. 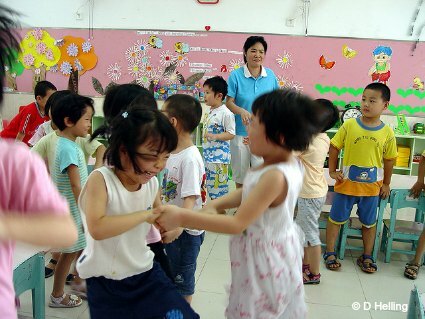 Children attend Kindergartens and Pre-Schools in their early years. These are not compulsory but seen as a way for kids to get a head start. In kindergarten and pre-school, kids start learning some English, go on field trips, participate in sports events, etc. just like all kindergarteners around the world. Compulsory education begins at around 6 - 7 years old when children start primary school. By the time first grade comes around, learning to read and write takes over and memorization and discipline kicks into high gear. It is of course more than learning your a-b-c's to put words together. In Chinese, each character for each word must be memorized. There are thousands of characters to memorize to be able to read a simple newspaper. It is this early on that children are conditioned to memorize. This culture of memorization continues on for the rest of their school years. After the first 9 years of compulsory primary and middle school come three years of high-school. The high-school years revolve around the preparation for the Gaokao examination, the college entrance exam which tests proficiency in four subjects: Chinese, math, English and a fourth subject chosen by the student among physics, chemsitry, geology, biology, political science or history. This is a very stressful time for students with many attending "cramming schools" in the evenings adding to their already heavy loads. The Gaokao is given once a year in early June. More than 9 million students take part on this two-day exam which will determine where they will go to University and in a way, their future. 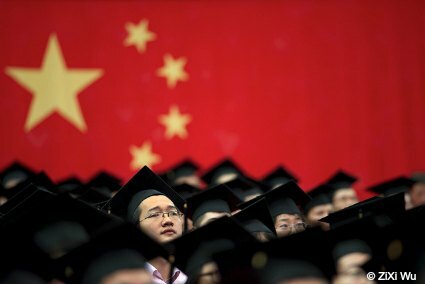 China's education system even though far from perfect, has been instrumental to China's rise. It produced the needed work force and strict work ethic and discipline to lift the country after the rubble left from the Cultural Revolution. As mentioned before, reforms are on the way in the Gaokao system. In the meanwhile, many more private colleges are emerging and studying overseas is also an alternative for some. Many parents that have gone through the system don't want that kind of pressure for their kids.